How ‘is yer boots, me ol’ trout? This post is dedicated to all my Mainland and International friends. Some of you may have heard me pose the question, “How ‘is yer boots, me ol’ trout?”. K posted a comment earlier today about Newfoundlanders & Labradorians and our wonderful sense of humor. Well I have certainly turned a few heads when I asked someone “how their boots are?” The look of confusion and lost stares are ever present on their face, because it is somewhat odd to ask someone about their boots, especially as a conversation starter. However, this is an expression I have either created or adapted as a friendly way of saying, “How are you today?” and well “Me ol’ Trout” or “My Old Trout” is just an expression for “old buddy” or “(good) friend”. I enjoy the humour and providing an explanation of this saying, because it is a great ice-breaker. It is an instant way for me to smile and tell the person what I really mean and begin to share aspects of my Newfoundland culture, heritage and upbringing. We certainly have a unique local language and regional dialect. However, local language variations and dialects are not uncommon and exists all around the world. French is much different in New Brunswick and Quebec than in France, because of expressions and adapted slang. As well, the North & South of France have regional language variations and barriers. Are language variations part of an urban and rural divide? If so, what happens as the world becomes more urban? Will languages be adapted and integrated? It is a curious concept. I often wonder if the Newfoundland & Labrador language and our never ending list of unique vocabulary is a result of the integration of the many cultures that inhabited Rural NL throughout history. We have had Maritime Archaic Indians, Groswater & Paleo-Eskimo, Recent Indians, Norse, Basque, French, English, Irish, Scotish and other European settlers all living here at one point in time. 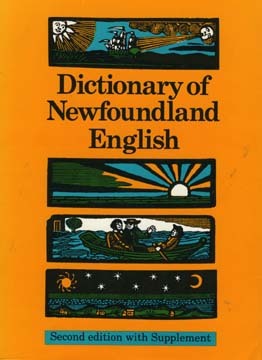 Was the result the Dictionary of Newfoundland English (the only province to have its own)? We learn from others and can share valuable experiences and knowledge. Culture, traditions and language does not remain stagnant and surely evolves over time. I invite you all to post comments regarding some of your favourite Newfoundland & Labrador words or expressions and your thoughts on our language. Posted on July 12, 2010, in Heritage and tagged Dictionary, English, expression, French, Labrador, Language, linguistic, Newfoundland, Rural, trout, Urban. Bookmark the permalink. Leave a comment.